My trip to Scotland at the end of November didn't happen. What's the next best thing I could do? Get a copy of Chris' superb Scotland book. As someone who has never been to Scotland, this is an excellent resource to plan a trip. We live in a time and age where we often forgo books and maps for the internet and mobile apps, but seldom that, what you find for free from the net, is of high (enough) quality. So if one is serious about a trip to Scotland, be it for the TGO Challenge, a solo traverse of the Cairngorms or any other trip, this tome of knowledge is required reading. After I got the book I wasn't able to put it back down. Chris manages to capture your interest with his writing style, and first after I went through the whole Introduction chapter I took a break. In the introduction you'll find pretty much everything you need to know if you plan to walk the glens and mountains of Scotland, from how to get there, how to behave in a bothy, where you can find accomodation and what gear would be smart to bring. Because I haven't been in Scotland before, it is also very, very useful that the book has a glossary at the end of the book - now I know that glen (Gleann) means valley, a Burn is a stream and a Loch is Gaelic/ Scots for lake. The maps are good, but for a trip you should get the proper OS maps. Chris is a good photographer, and the book is full of fine photos from mountaintops with great views, waterfalls and scenic wild camping spots which makes you want to pack your rucksack and start walking right away. Chris divided the mountain areas of the region into seven areas - from the Southern Uplands to the Northern Highlands and The Islands. Each of these chapters starts up with a summary, which lets you know the highlights of the region, a general map to get an overview and an introduction. Then Chris dives into the details, describing hills, access to the area, where you can finds pubs & accommodation as well as suggestions for routes and trips. Because Chris has walked all the munros - twice! - he knows the region, and you can feel that when reading this book. However if you expect ready-made routes, think again - Chris wants to inspire and encourage readers to plan their own routes and trips, while he gives them all the tools they would need for it. A list of further recommended reading, the current list of Munros and Corbetts (apparently mountains in Scotland are still growing/ shrinking =), and a handy Index round out this tome. At a massive 1184 gram, divided over 557 pages, Scotland by Chris Townsend is something to read at home, next to the fire while pouring over maps to plan a trip. 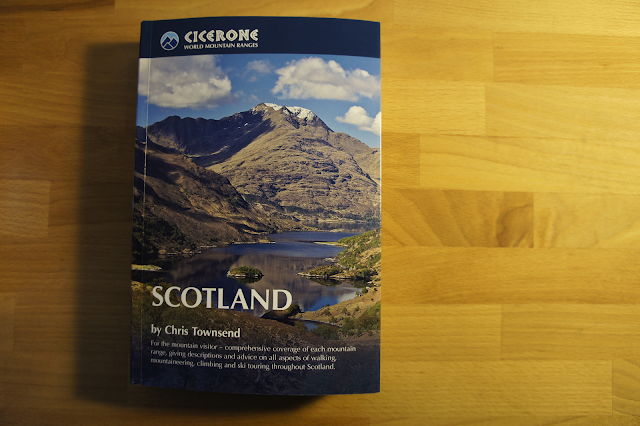 Cicerone was so friendly to allow me to raffle off one copy of Scotland by Chris Townsend. To participate, you need to leave a comment and tell where in Scotland you'd like to go. The raffle closes on Sunday, 2nd of January at noon Finnish time and the winner - determined by Random.org - will be announced in The Week in Review on that day. For those who don't trust their luck or can't wait, click the underneath photo & link to purchase your own copy.